Mahmud writes, "At the invitation of Mrs [Alice] Breed [the mother of Florence Breed, who married Ali Kuli Khan], the Master went for an automobile ride along the coast of the Atlantic Ocean through a wide thoroughfare about nine miles long and guarded on the ocean side with iron rails. It is a recreation spot, very green and clean, and `Abdu'l-Bahá praised it highly. This visit is a proof of faithfulness, proof that we have not forgotten one another. In the world of existence nothing is greater than faithfulness, for it allows love to remain unimpaired in spite of the length of time. Behold how faithful were those blessed souls in Persia who, when under the sword, praised the Blessed Beauty. No affliction or persecution could turn them from faithfulness. On the altar of sacrifice they raised cries of `Yá Bahá'u'l-Abhá' from their hearts and souls. This is real faithfulness. In the evening at the girls' school He spoke about the rights and education of women. At the conclusion, everyone came to shake His hand with sincerity and gratitude. Because `Abdu'l-Bahá was tired and it was too far to go back to Malden, He stayed at a hotel in Boston and went to sleep without supper." The girls' school was at the Franklin Square House, 11 East Newton, which is now used as a residence. I am not sure which hotel He stayed at. 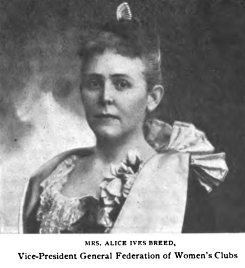 This is the only photo of Alive Ives Breed that I have found. She is the one who had the birthday cake for Abdu'l-Baha back in May.